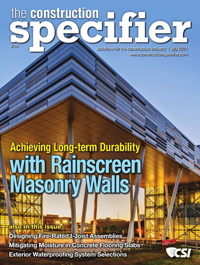 The Construction Specifier is the only peer-reviewed U.S. publication targeted to those professionals who select, recommend and influence buying decisions. It is the official magazine of the Construction Specifications Institute (CSI). **Kenilworth Media cannot guarantee the quality of articles prior to 2001.